The information from the ALE file has to be merged with available master clips in the Avid Media Composer. 1. Generating an ALE file is part of the Transfer process in Silverstack. So select the bin which contains the relevant clips, click on the “Transfer” button in the TabBar of the Silverstack window and choose “to Avid Media Composer (ALE)”. 2. Thereon select the clips you want to transfer in the wizard that opens up. 3. In the following you have to select the information to be transferred (figure 1 #1). Besides the required general information you can additionally select master information (as scene, shot, take etc. ), exposure information (as ASA, whitepoint, shutter etc. ), format information (as resoluion, FPS, codec etc. ), user information (as flaging, rating etc.) and a file information summary. 4. The metadata is transferred to the Avid Media Composer via the ALE file and is only there matched with the clips (figure 1 #2) . The matching can be performed according to following metadata information: source file, the reel name in the tape column or the source file in the tape column. 5. Click on “Save ALE…”. After having created the ALE file go to the Avid Media Composer and import the clips if not done so far. They should thereon be available as master clips. 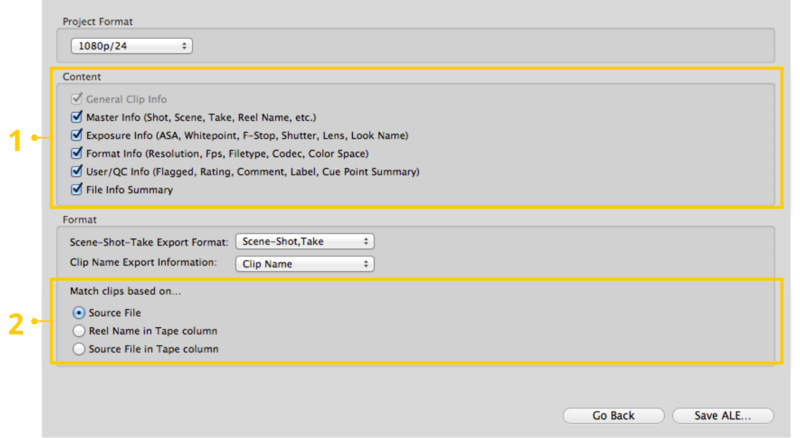 Select the bin in the Avid Media Composer which contains the relevant clips. Select those clips and choose “Input > Import Media…” from the context menu in the bin. Open the “Options”, then click on “Options…” navigate to the Shot Log tab and select “Merge events with known master clips”. Navigate to the ALE file you created before and click “Open”. Avid Media Composer now matches master clips and metadata information from the ALE file according to their timecode and the criteria you selected during the transfer process within Silverstack . The information from the ALE file is attached within additional columns in the bin table as in figure 2. Some of the columns are already known by the Avid Media Composer, all unknown information will be added as custom columns. Right-click in the free space of the bin window and click on “Choose columns…” in the context menu. Then select and unselect columns, the custom columns from the imported ALE file you will find at the end of the list.